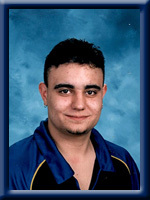 ROY – Gordon R., 28, of Dartmouth, formerly of Liverpool, passed away suddenly on August 31st, 2010. Born in Liverpool, he was a son of Gary R. Roy (Sheila Oickle) of Milton and Judith Lea (Baker) Roy (Mary McDonald) of Greenwood. Surviving besides his parents is his daughter Jasmine of Liverpool, his maternal grandmother Julia Baker of Moncton and his “special Mom” Brenda Slauenwhite of Liverpool. He was predeceased by his paternal grandparents and his maternal grandfather. My prayers and heart go out to you at this sad time.Gordon was a dear friend to me, He will be missed..
From all the Rideout families our sympathy goes out to you. So sorry Brenda. I know Gordon was your son in heart. so sorry to hear about your loss Brenda it seems so unfair…you were the only mom he really knew…he was dealt a raw deal , know I love you and hold onto the memories of him, his little girl will want to know all about him when she gets older….prayers and condolences to you and Aimee hugs. Sorry to hear about your son Brenda I didnt know your son but I know he was very special to you both .Prayes are being send to you all at this time…. So sorry to hear about Gordon. We don’t have all of life’s answers and we surley don’t have the answers for something like this. Our thoughts and prayers are with you. Jasmine now will always be your everlasting connection with Gordon. As she smiles, he smiles…, as she laughs, he laughs…, and when she looks at you, he’ll be looking at you… Treasure every moment! Please except our sincere condolences. sorry to all his family.I knew you all including him sence I was in diapers.he was a great person and friend,he was family to me.he will be missed for a long time to come.I give my love and thoughts to my aunt brenda and his father gary and rest of the family. I’m very sorry to hear about your loss. He was a good guy and always made me laugh when we hung out. My thoughts and prayers are with you during this difficult time. My mom has told me so much about you, I’m sorry for your loss, Brenda, and Gary, our prayers go out to you both, Gordon was a very nice guy, & very funny. From Shelly & Nelson & Kids.